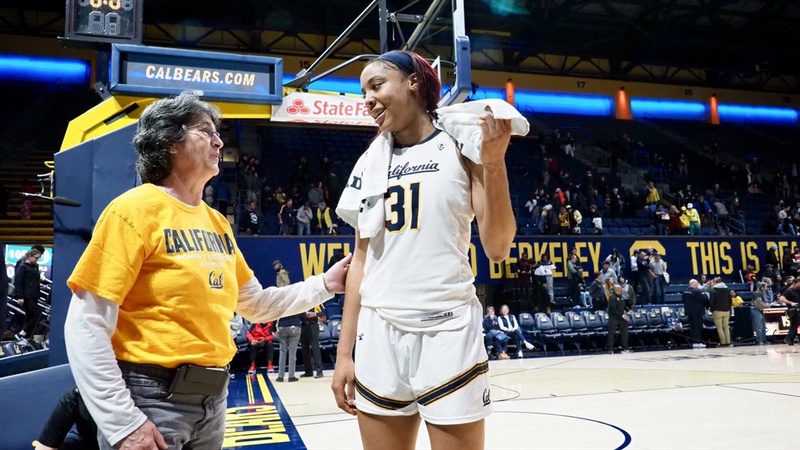 Kristine Anigwe made history, becoming Cal’s all-time leading scorer, and the California Golden Bears fought hard but were simply outclassed by No. 3 Oregon, falling 105-82. Oregon shot 60% from the floor, including and amazing 87% in the fourth period to run away with the game. Anigwe’s very first point of the game--a free throw--was the 2321st point of her storied career, and it edged her into first place in the Cal record books, just ahead of Colleen Galloway. Anigwe ended the game with 23 points and 18 rebounds. Receé Caldwell had six threes and 22 points, and Kianna Smith had five treys and 20, as the Bears generated enough offense to beat many teams. But the Bears simply could not stop Oregon, the highest-scoring team in the nation. Sabrina Ionescu, from nearby Miramonte High, put on a show for her hometown supporters, scoring 17 in the first half en route to 27 points, on an efficient 10 of 15 shooting nigh. Satou Sabally matched her shot for shot, scoring a game-high 31 while grabbing nine rebounds. Maite Cazorla had nine assists while notching 17 points of her own. As a team, the Ducks hit 14 of 23 threes (61%), but the real story was how Oregon executed the pick and roll to perfection, earning an overwhelming 46-24 edge on points in the paint. Cal falls to 14-8 (5-6 Pac-12); Oregon improves to 22-1 (11-0). The Ducks took it inside to start the game, with Ruthy Hebard scoring over Anigwe down low. Oregon then used the high screen for three more scores, with Sabrina Ionescu finding an open lane twice and Satou Sabally hitting a three from the top of the arc, as the Ducks earned the 12-0 lead. On the other end, the Ducks used their length to stymie the Cal offense, picking off passes and forcing Cal into rushed jumpers. Ionescu turned a steal into a breakaway layup. “It was very important for us to come out and execute from the start,” said Ionescu. “We weren’t at the level we needed to be at the start of the game,” said Gottlieb. At the 6:38 mark, Anigwe earned the trip to the foul line. She hit the second attempt, earning her the spot as the #1 scorer in Cal basketball history. Ionescu hit two free throws, scoring 11 of Oregon’s first 16 points. McKenzie Forbes gave Cal a lift off the bench, knocking down a baseline jumper. Ruthy Hebard picked up her second foul at the 5:19 mark and went to the bench. Her absence slowed down Oregon’s offense. The Bear defense forced consecutive turnovers, and Anigwe then went to work on the other end, scoring three consecutive baskets. She also continued to terrorize the glass, grabing eight rebounds in the first quarter. Recee Caldwell kept Cal afloat with consecutive threes from way beyond the arc. Her second got Cal back within 24-17 with 15 seconds to go, but Cazorla calmly ran the offense, finding Oti Gildon for a layup and the 26-17 lead to close the first period. Recee Caldwell drove under the basket and found an open Asha Thomas in the corner. Thomas knocked down a three. CJ West then scored down low, and Cal started the second quarter with good execution and positive energy. Thomas then hit a jumper from the elbow, and Caldwell hit another three, pulling Cal with 28-27, at the 7:24 mark. The Ducks focused their defense on Caldwell, and she found Kianna Smith, who heaved a three to beat the buzzer. The shot fell, earning Cal their first lead of the game, 32-30, hafway through the second. Sabally scored five in a row for the Ducks, and then assisted on a basket by Oti Gildon, as Oregon regained the lead . Oregon applied soft halfcourt pressure to slow down Cal’s offense. The Bears showed patience, working the ball around until they were able to get the ball to Anigwe. But the Ducks collapsed on Anigwe, daring the officials to blow the whistle. The ploy worked, and the Bear offense stalled. On the other end, Oregon again executed on offense, breaking down Cal’s perimeter defense with ease. A three by Erin Boley highlighted the 11-0 run and the Ducks wrested momentum away, stretching out to the 44-34 lead. Jaelyn Brown hit a jumper the close the scoring for the half, and the Bears found themselves down 44-36. “The last few minutes of the first half was huge,” said Graves. Caldwell’s 11 points led Cal at the half, and Anigwe had nine along with 14 rebounds. Ionescu had 17 on seven of 10 shooting, and the Ducks hit 48% of their attempts in the first 20 minutes. Sabally scored 10. Ionescu opened the third again driving to the basket, earning two free-throws. Caldwell matched her with a drive of her own. Sabally showed off her range with two more threes, burning the Bear defense that continued to go under screens. Anigwe hit two long jumpers of her own. Caldwell hit another three, pulling Cal within 55-49. But very few teams can match the Ducks’ firepower from distance, and Boley and Cazorla promptly hit treys of their own. Boley then scored inside against a scrambling Cal defense, and the Oregon went up 63-49, at 4:46 in the third. Kianna Smith gave the Bears some hope, scoring a nifty leaner and then knocking down a three. But Oregon continued to flow, with Boley and Ionescu hitting from beyond the arc, and the Ducks led 71-54 after three periods of play. Oregon exploded for six threes (on nine attempts) in the quarter. “We took their best shot and answered,” said Graves. On the first possession in the fourth, Anigwe again found herself tripled teamed in the paint. The senior found West underneath for a score. But Oregon has great posts of their own, and Oti Gildon and Hebard scored on the other end. Ionescu hit a three, and the Ducks had the 20-point lead, 78-58. Caldwell continued her great night, hitting two more threes, but the Bears could not slow down Oregon’s offense. Ionescu, Cazorla, and Sabally took turns beating their defender off the dribble, forcing Anigwe to make a choice on defense, knowing that either way, the Ducks would get a high-percentage shot. The Ducks hit 13 of their first 14 shots (93%) in the fourth quarter. Kianna Smith got hot late for Cal, scoring 11 points at the end of the game. Sabally hit two more threes to cap off the specular game for herself and her team. The Bears won’t have much chance to lick their wounds, as they will face No. 7 Oregon State on Sunday.